If we are looking for good stories by which we would like people to define the 2016 season, then we have to look pretty hard. Brisbane, Collingwood, Fremantle, Port Adelaide, Gold Coast and Richmond stunk up the place. Clearly sick of being happily regarded as plucky underdogs, the Kangas did everything they could to make fans dislike them. Geelong did well enough to annoy you but not well enough to beat Hawthorn, who are still ominously good. The Doggies showed early fairy-tale signs and then got so many injuries that it was like they were allergic to air. The Giants, on the other hand, stayed the course through to the finals. So everyone complained about their draft concessions. In between, there was some other miserable gunk. Eddie McGuire and Sam Newman slagging off Caroline Wilson. Lachie Whitfield and the Terrible, Horrible, No-Good, Very Bad Break Up. Michael Talia’s ‘alleged illicit substance’ bust. And that perennial plague of racism, this time manifested against Eddie Betts. So if we’re looking to positively define the 2016 season, there is really only one option for the Footy Almanac cover. 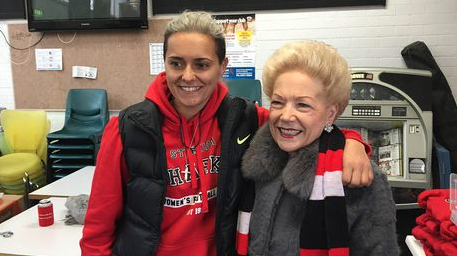 And that is the arrival of women’s football, embodied by Collingwood marquee recruit Moana Hope and female football’s godmother Susan Alberti. The Footy Almanac is about the passion and stories behind the game. About all walks of life finding common ground in the magic of footy. About local footy, the fans and the people. The stories of Mo and Susan – and more importantly, how their stories intertwined – are what the Almanac is made for. Mo Hope is one of the playing faces of women’s football, almost universally hailed as the game’s best forward. She kicked 104 goals in the inaugural VFL Women’s season – her nearest competitor finished with 76. Her talent is only part of what makes her a champion. Like the best of the Almanac’s stories, life off the ground enhances life on the ground. Mo was born in Glenroy and is one of 14 children. Her mother Rosemary, who raised all of her sons and daughters on her own after Moana’s father died of cancer, is her hero. On top of training and playing for the St Kilda Sharks, she’s a full-time Operations Manager for Utility Traffic Management and carer for her sister Lavina, who was born with Moebius syndrome. When I first met her earlier this year, she told me that footy doesn’t tire her out because it’s her passion. Susan looks and sounds like the Queen but, like Mo, she has never been given anything in her life she didn’t have to fight for. In between becoming Vice-President of the Western Bulldogs and founding industrial company DANSU Group and the Susan Alberti Medical Research Foundation, her husband Angelo was killed in a car accident and her daughter Danielle died in her arms following complications from diabetes. Her support of women’s football has ranged from financially reviving the Victorian Women’s Football League to throwing her full support behind the establishment of Women’s AFL Exhibition matches. Their friendship captivated the nation on the August 29 edition of Australian Story on ABC. The wonderful documentary captured the parallels between Mo and Susan, who really do look like cartoonish opposites in a superficial sense. For two women, football became a way to find strength, fight challenges, bridge gaps and achieve something for future generations. Is there anything else an Almanac cover needs? A link to that “Australian Story” appears here. Poignant, pertinent and persuasive, Callum. The most sensible suggestion so far. Women are the future of the game. Would love to see Swanny on the cover, but Mo and Susan represent a nascent narrative in the game, that I hope gets bigger and better in the coming years. Saw Mo on AFL 360 on Monday night in the Collingwood polo. Has a sleeve of tatts that makes her look like Swany’s younger sister. Combined cover – Swany and Mo. Gender balance and keeps the Lord Bogan’s baby boomers and Callum’s Gen Y happy. I’d be into painting this! I’m GEN X PB. Sheesh, am I starting to sound like a Boomer? Sad.